Roughly a century ago, President Theodore Roosevelt said, “I think there is only one thing in the world I can’t understand, and that is Ohio politics.” If The Ohio Politics Almanac had existed then, Roosevelt still might not have understood Ohio politics, but it wouldn’t have been for lack of information. 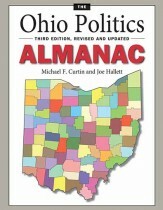 A comprehensive and authoritative resource, The Ohio Politics Almanac sheds light on the complexity of Ohio’s electoral statistics. This carefully researched and engagingly written political biography marks the first full treatment of Ohio native and politician Martin L. Davey. An important figure on the local, state, and national political scene in the early decades of the twentieth century, Davey served as mayor of Kent, Ohio, was elected to the U.S. House of Representatives, and completed two terms as Ohio governor. When first published in 1994, Ohio Politics was defined as the first comprehensive survey of the state’s post–World War II politics. A collaborative effort by a team of journalists and political scientists, this collection examines the major political events in Ohio since 1944 and provides insight into the state’s key personalities, institutions, and processes. This revised and updated edition continues the survey from 1994 through the Taft years and the 2006 gubernatorial elections.